Jon Cavaiani was born in Royston, England in 1943 and immigrated to the United States with his parents in 1947, becoming a naturalized American citizen in 1968. He enlisted in the U.S. Army on May 7, 1969, and was trained as an Infantryman. Cavaiani completed Airborne training and Special Forces training before deploying to Southeast Asia in August 1970, where he served with a Special Forces Training Advisory Group in South Vietnam. He was captured by the North Vietnamese Army on June 5, 1971, during a mission in which he would later be awarded the Medal of Honor. After spending 661 days in captivity, Sgt Cavaiani was released during Operation Homecoming on March 27, 1973. After returning from Vietnam, he served as an instructor at Fort Bragg, North Carolina, from July 1973 to August 1974, when he became the Chief Enlisted Advisor for U.S. Army Readiness Region IX in San Francisco, California. His next assignment was as an Operations Sergeant on the Allied Staff in West Berlin, Germany, from September 1977 to August 1980. 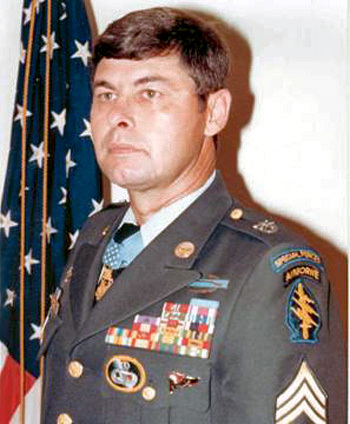 Cavaiani then served with the 10th Special Forces Group at Fort Devens, Massachusetts, from August 1980 to May 1983, and then with the 11th Special Forces Group at Fort Meade, Maryland, from May 1983 to June 1984. He then transferred to the 97th Army Reserve Command, also at Fort Meade, where he served until September 1985. His next assignment was as NCOIC of Plans, Operations, and Training and then as Operations Sergeant Major with the Flight Concepts Division at Fort Eustis, Virginia, where he served until May 1989. Sgt Maj Cavaiani's final assignment was as Chief Instructor at the Army ROTC detachment at the University of California, Davis campus, from May 1989 until his retirement from the Army on May 31, 1990. Jon Cavaiani died on July 29, 2014. S/Sgt. Cavaiani distinguished himself by conspicuous gallantry and intrepidity at the risk of life above and beyond the call of duty in action in the Republic of Vietnam on 4 and 5 June 1971 while serving as a platoon leader to a security platoon providing security for an isolated radio relay site located within enemy-held territory. On the morning of 4 June 1971, the entire camp came under an intense barrage of enemy small arms, automatic weapons, rocket-propelled grenade and mortar fire from a superior size enemy force. S/Sgt. Cavaiani acted with complete disregard for his personal safety as he repeatedly exposed himself to heavy enemy fire in order to move about the camp's perimeter directing the platoon's fire and rallying the platoon in a desperate fight for survival. S/Sgt. Cavaiani also returned heavy suppressive fire upon the assaulting enemy force during this period with a variety of weapons. When the entire platoon was to be evacuated, S/Sgt. Cavaiani unhesitatingly volunteered to remain on the ground and direct the helicopters into the landing zone. S/Sgt. Cavaiani was able to direct the first 3 helicopters in evacuating a major portion of the platoon. Due to intense increase in enemy fire, S/Sgt. Cavaiani was forced to remain at the camp overnight where he calmly directed the remaining platoon members in strengthening their defenses. On the morning of 5 June, a heavy ground fog restricted visibility. The superior size enemy force launched a major ground attack in an attempt to completely annihilate the remaining small force. The enemy force advanced in 2 ranks, first firing a heavy volume of small arms automatic weapons and rocket-propelled grenade fire while the second rank continuously threw a steady barrage of hand grenades at the beleaguered force. S/Sgt. Cavaiani returned a heavy barrage of small arms and hand grenade fire on the assaulting enemy force but was unable to slow them down. He ordered the remaining platoon members to attempt to escape while he provided them with cover fire. With 1 last courageous exertion, S/Sgt. Cavaiani recovered a machinegun, stood up, completely exposing himself to the heavy enemy fire directed at him, and began firing the machinegun in a sweeping motion along the 2 ranks of advancing enemy soldiers. Through S/Sgt. Cavaiani's valiant efforts with complete disregard for his safety, the majority of the remaining platoon members were able to escape. While inflicting severe losses on the advancing enemy force, S/Sgt. Cavaiani was wounded numerous times. S/Sgt. Cavaiani's conspicuous gallantry, extraordinary heroism and intrepidity at the risk of his life, above and beyond the call of duty, were in keeping with the highest traditions of the military service and reflect great credit upon himself and the U.S. Army.